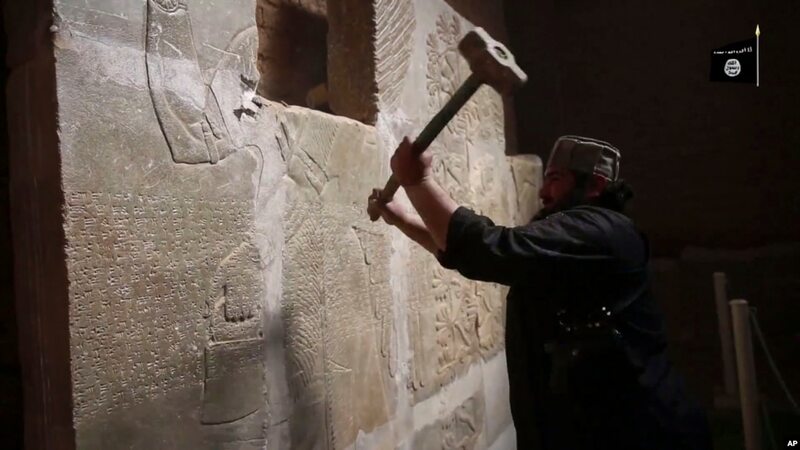 FILE – This image made from video posted on a militant social media account affiliated with the Islamic State group, April 11, 2015, purports to show a militant taking a sledgehammer to an Assyrian relief at the site of the ancient Assyrian city of Nimrud, which dates to the 13th century B.C. After U.S.-backed Iraqi forces pushed the Islamic State from Nimrud earlier this week, they found the archaeological site of an ancient Assyrian city reduced to rubble. Months before the Iraqi advance, IS destroyed statues, bulldozed palaces that date back some 3,000 years, and destroyed much of the remains of the ziggurat — once one of the tallest buildings remaining from the 9th century B.C. 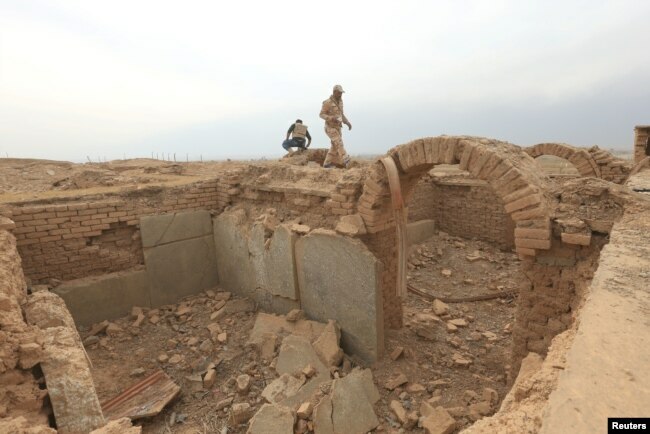 The level of destruction to Nimrud is of such a magnitude that “it is hard to believe that this is recoverable,” Sermed Alwan, an Iraqi archaeologist, told VOA. A member of the Iraqi army walks around the remains of wall panels and colossal statues of winged bulls, destroyed by Islamic State militants in the Assyrian city of Nimrud, south of Mosul, Iraq, Nov. 16, 2016. Located about 19 miles southeast of Mosul, Nimrud is the biblical name given in modern times to Kalhu, the capital of the Assyrian Empire from 1350 to 610 B.C. The nearly 3,000-year-old city was a forgotten treasure buried underground for centuries until 1849, when archaeologists first began excavating it. “It is the most important city in Mesopotamian history after Babylon, the capital of the Babylonian civilization,” Alwan said. The site stood undisturbed for decades until last year, when IS destroyed it, citing its “un-Islamic” nature. 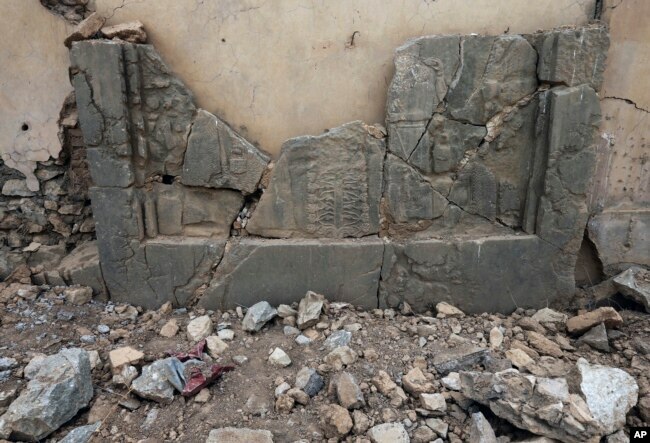 Carved stone slabs which were destroyed by Islamic State militants are seen at the ancient site of Nimrud, some 19 miles (30 kilometers) southeast of Mosul, Iraq, Nov. 16, 2016. IS released a video in April 2015 showing men blowing up the site; breaking ancient walls with electric drills; and destroying relics, images and other artifacts. 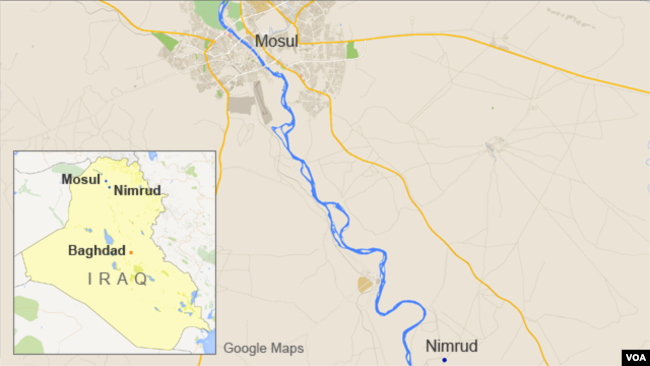 Satellite pictures taken by U.S. coalition partners have shown Nimrud’s steady destruction since September. UNESCO, the cultural heritage arm of the United Nations, called the destruction a war crime and urged political and religious leaders in the region to stand up against the demolition of Nimrud. The city ziggurat — a tiered temple — has been reduced to a pile of dirt. The destruction also included the library of Ashurbanipal, which is believed to be the world’s first library. “There were about 200 ancient panels. [Islamic State] stole some of them and destroyed the rest,” Iraqi Major General Dhiya Kadhim al-Saidi told Reuters on a visit to the site Wednesday. Saidi said IS had been driven about two miles northwest of Nimrud, but the area had not yet been cleared of possible bombs and booby traps. The Iraqi operation is part of an offensive to drive IS from Iraq’s second-largest city of Mosul and its neighboring areas. An Iraqi soldier stands in front a damaged part of the ancient site of Nimrud, which was destroyed by Islamic State militants, some 19 miles (30 kilometers) southeast of Mosul, Iraq, Nov. 16, 2016. 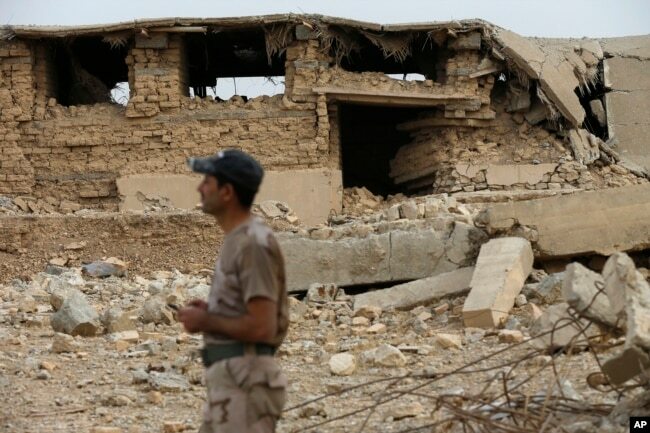 Since mid-2014, IS has destroyed dozens of historic sites in Iraq and Syria including mosques, churches and Shi’ite religious halls known as hussainiyas. IS remains in control of some historical landmarks, including the 2,000-year-old desert city of Hatra in Iraq, famed for its pillared Assyrian temple that blended Greco-Roman and eastern architecture. Iraqi archaeologist Alwan said that, because of continued fighting in the Nimrud region, a team of experts would not be able to visit the site soon, leaving it vulnerable to more damage. “Iraqi forces fighting IS in Nimrud and other ancient sites that surround Mosul do not have enough knowledge and experience to deal with such an important archaeological site or to keep it safe from vandalizing or further destruction,” Alwan said.